Up until very recently I was immersed full time in the professional eventing world for nearly 14 years under a number of different people or working for myself, out of a number of different locations. I’ve been a working student, a barn manager, a horse camp counselor, taught in a beginner lesson program, a groom, an assistant trainer and, most recently, run my own full-blown eventing business. I’ve ridden to the CIC*** level on two different horses and been named to the U.S. Equestrian Federation Developing Riders Lists three times. I currently live in West Chester, Pa., a far cry from my roots in North Texas, and I’m completing my master’s degree in industrial/organizational psychology. This story is about how I ended up here and why I chose an alternative to the horse pro life. In my opinion, people often confuse their love of the sport with love of the business. What Defines Really Making It? If your goal is to run young horses around the lower levels, have a random upper-level horse here or there, run a standard training program out of someone else’s barn, and make just enough money to survive, more power to you. But that’s not what everyone dreams of as a little girl, is it? We all wanted a string of horses contending for U.S. teams, a farm to call our own, and then yes, perhaps just enough money to survive on. If that’s what you want, and you intend to only work in the horse industry you’ll need to figure out a way to get the financial backing necessary to support your dreams. And you’ll need to be lucky. Caitlin Deisler, a young rider from Forney, Texas, and a former student of mine, struck me as exactly the kind of talented and determined kid who could, if she found the funding, realize her dreams. Her love of horses and her desire to be a professional probably mirrors the sentiments of the majority of our upper-level event riders when they were her age. Honestly, I wrote this article with her in mind. I love her passion, but I want her to know the truth about the business. I want her to be prepared to attack her goals the right way in order to achieve her wildest dreams. Everyone either knows upfront or finds out quickly that 80-hour workweeks are the norm in this business. The horses break, and so do we. Sometimes you will thoroughly enjoy the work and think how lucky you are to be behind a set of ears, outside on a glorious day, or learning something fascinating about a sport that we all love so passionately. But sometimes that passion feels faded by fatigue, burnout or aching body parts. 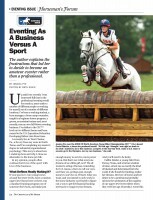 This is an excerpt from the article “Eventing As A Business Versus A Sport” by Jessica Pye, which appears in the July 25 issue of The Chronicle of the Horse, which is our annual eventing issue. If you’d like to read the article in its entirety, you can subscribe and get online access to a digital version and then enjoy a year of The Chronicle of the Horse and our lifestyle publication Untacked. Or you can purchase a single issue or subscribe on a mobile device through our app The Chronicle of the Horse LLC. Also in the July 25 issue: a feature on eventing’s secret show jumping weapon, Richard Picken, an in-depth profile on the U.S. Eventing Association’s new president Carol Kozlowkski, Between Rounds with Denny Emerson on “those old military guys,” and an informative horse care story on laryngeal hemiplegia and dorsal displacement, or roaring, and much more. CLICK to see the entire July 25 issue table of contents.